because it's a wide wide worldly web out there, and you may never see them again. Last week I saw at least three examples of real people wearing sophisticated-yet-funky white pleated maxi skirts and I WAS IN LOVE. Now all I can find are ads for said skirts - failing to capture the spirit of the look I want. So here I am, trudging through the cavernous interwebs, looking for style. 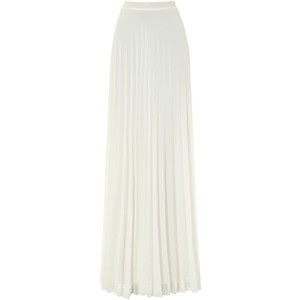 If you see a white pleated maxi skirt, modeled by a human, preferably with a chunky belt, I implore you - send the link my way! Until then, I soldier on. This is what came to my mind, when reading your post. It's missing the belt but otherwise fits your description.